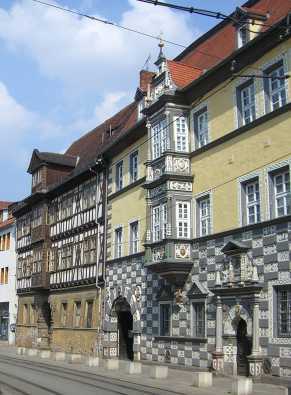 Luther began his university education in Erfurt, one of the largest cities in Germany with a population of around 20,000 and commercial center of the state of Thuringia. The university was the third largest in Germany. As in all European universities the Greek philosopher Aristotle – Plato’s student and teacher of Alexander the Great – was the principle authority for all studies. In working toward a baccalaureate one would study Aristotelian logic, dialectics, rhetoric and grammar. At the completion of his baccalaureate studies Luther was 30th out of 57 students, no doubt due to the quality of his pre-university studies. After the baccalaureate courses, students went on to Aristotelian metaphysics, ethics, politics, and economics. To round out studies for the Master of Arts they spent time in special seminars and disputations, debating important works of Aristotle and also studying music, arithmetic, geometry and astronomy. The studies were very demanding, but here Luther’s class ranking was second out of 17. He received his Master of Arts degree in philosophy and was accorded special elite status. In the German language one addresses close family, children, servants and pets with the pronoun form you as “Du”, and persons of higher status “Ihr”. Luther’s father now used the “Ihr” form with his son. To this point all university education was the same. After obtaining the Master of Arts degree, one could then continue with one of the three “professional” schools, the higher faculties of theology, jurisprudence (law), or medicine. The boom in cities resulted in needing lawyers to fill the civil service areas, and of course doctors were always in demand. Theology benefitted from this academic boom. Townspeople were tired of priests who could not read, write, or conduct a simple mass coherently, and were increasingly wanting academically trained theologians. Universities like Erfurt, which was city sponsored rather than paid for by a prince, was able to take advantage of these theologians as professors of theology. As his father wished, Luther enrolled in the Doctor of Law degree program so at the end of his studies he could become a city councilor like his cousin Hans Lindemann. All was going as planned until Luther had a dramatic and sudden change of direction. It was not the first dramatic incident in his life. The first event occurred when he was with a friend heading for home at Easter school break in 1503 or 1504. As they approached the city, Luther managed somehow to cut an artery in his thigh with his student sword. His companion ran to get a doctor while Luther tried to stop the bleeding until his return. That night it began bleeding again and he prayed to Mary to save him. He survived this incident and spent his healing time learning to play the lute and copying music for it – not the attitude of someone in terrible distress. Shortly after that there was an outbreak of plague, however, and he lost two of his college professors and a classmate. This must have given him pause for reflection on the fragility of life. The second encounter of importance to Luther occurred on his way back to the university from his home. 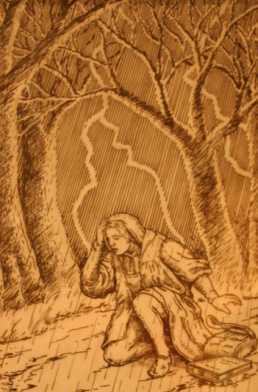 He was caught in a terrible thunderstorm about six miles from Erfurt near the town of Stotternheim, when a lightning bolt hit near him. This time he was so terrified that he cried out to St. Anne to save him and he would become a monk. All his life he stated that his vow was forced from him: He did not willingly say it. He later said that Anne was his idol at that time. She was a “new” saint and considered a helper in dangers from thunderstorms and also the patron saint of miners, so it makes sense he would call on her. (It is interesting that in both of these life threatening incidents it never occurred to him to call on God or Jesus Christ.) Luther’s classmates in the university and others in the monastery and elsewhere compared his experience to that of Paul’s conversion on the way to Damascus or at least it was a call from heaven telling him to enter the monastery. Luther himself said that it was not a call from heaven at all, but his fear of salvation for his soul that forced him to become a monk. He was driven by the fear of Christ as judge. Only by fasting, praying, and cutting himself off from society could he hope to win God’s favor and merit eternal life. He was not turning to a loving God, but turning away from an angry, demanding God whose favor he had to win or be damned through all eternity. Needless to say, Luther’s father was not happy with this turn of events. He had made it possible for Luther to get a good education and make him a son to be proud of, but Luther was throwing it all away. He was furious at Luther. It was his God-given right as a father to demand obedience from his son. After he calmed down a bit he had to admit that if God wanted his son to be a monk he had to bow before God’s judgment, but he didn’t have to like it. He began again to use the “Du” form to address his son. On July 2, 1505, two weeks after his vow, he entered the monastery of the Augustinian Hermits (also called the Observant Augustinians). This was the strictest order of the Augustinians. Luther would have to practice killing his own will, eat meager meals, work hard during the day, keep vigil at night, mortify the flesh, beg, and fast. When entering the monastery the question was asked, “What do you want here?” and the reply was “The gracious God and your mercy.” Novices were warned that it was not those who began monastery training that would be saved, but only those who completed it. This warning hung around Luther’s neck like a weight, Luther determined that he would complete his vows. He knew the Blessed Virgin and St. Augustine would intercede for him and the Holy Spirit would comfort him in his battles with the Devil. It is interesting that even at Luther’s ordination his father wondered if the Devil had a hand in Luther’s decision. Everyone knew the Devil could produce thunder and lightning, but surely the Devil couldn’t do the good work of sending someone to a monastic life. Still, Luther battled this Devil his whole life.